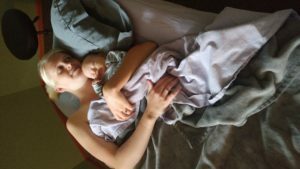 In the days following childbirth, a new mother benefits greatly from massage therapy. During the final weeks before delivery, her ligaments loosen to allow for baby to make their way through the pelvis; during this time her muscles will compensate for the lack of stability. Following the birth process, her ligaments will tighten often causing low back and hip pain. Another common postpartum symptom we treat is upper back and neck pain. When a baby is feeding, we tend to lean into them, protecting them lovingly. When our posture is broken down it can cause strain and pulling in the back of our shoulders with tension traveling up into our neck, sometimes causing headaches. By having massage treatments following giving birth this pain can be reduced. We work on her trouble areas, of course babies are always welcome in our office. We make sure mom and baby are comfortable during treatment.